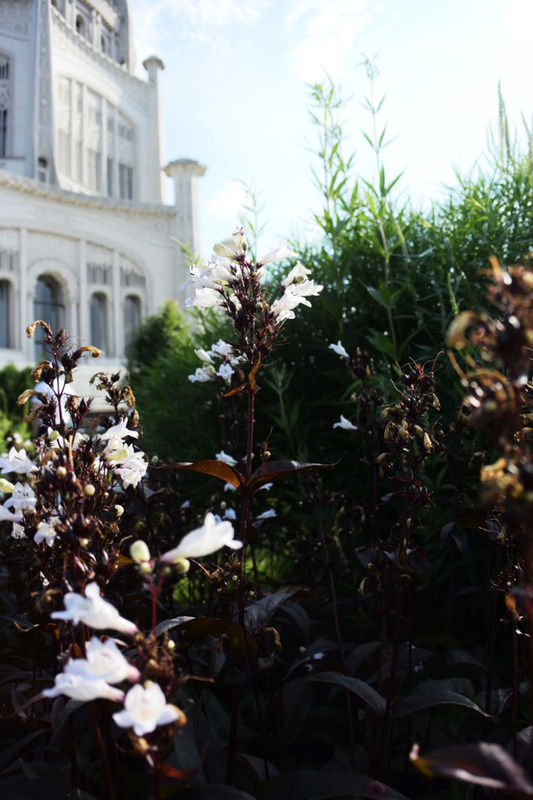 I've lived in Chicago for almost 4 years, but somehow this is the first time I've made it up to Wilmette to see the beautiful Baha'i House of Worship. This gorgeous structure is meant to represent the "oneness of humanity" and includes symbols from every major religion coming together; this speaks to the central Baha'i belief that the different Gods from all religions are actually one and the same, and He has been guiding us from the beginning of time. I personally identify as a Catholic, but I was still so moved & inspired by this sacred space. The building itself is exquisite - the design is beautifully balanced as it is ornate yet entirely white, made up of a combination of cement and crushed quartz. The surrounding gardens are so lush and green, and the wide expanse of blue sky brightened everything up. I'm sure that throughout the seasons and even during various time of day, the temple looks remarkably different. The building is made up of nine sides, and each side has a pool and/or landscaping including greenery and flowers. Each side is completely unique, and I found walking around through each of the gardens incredibly meditative. I think these were my favorite flowers at the temple. The dark maroon stems are so rich and lovely paired with the bright white flowers and surrounding greenery. My trusty Birkenstocks matched one of my all time favorite flowers: alyssum. I love how many different colored flowers are used in the gardens. There doesn't seem to be a set palette, which allows each section to take on its own personality. My colors this week are a mix of earth tones & brilliant blues - warm & bright palettes for summer that show off the most simple yet striking colors of creation. Brought to you by the Pantone Design Studio app. As these two palettes are rather different, I went with one set of earth tones and one set of sky tones. For the earth tones I chose A Verb for Keeping Warm's Annapurna, which is naturally dyed using plant cuttings and extracts. The sky palette is made up of Brooklyn Tweed's new yarn, Vale, which I've been dying to try out - this lace weight yarn comes in a gorgeous collection of colors and this is just one of the sets that would make something truly exquisite. From left to right: lighthouse, alpine, barnacle, zinc, mollusk. Photos by A Verb for Keeping Warm. From left to right: vernal, sashiko, norway, heron, nocturne. Photos by Brooklyn Tweed.